Los Angeles Dodgers manager Dave Roberts was recently named the National League’s Manager of the Year in voting by the Baseball Writers’ Association of America. Roberts, who received 16 of 30 first-place votes, joins Hall of Famer Tommy Lasorda (1983, ’88) as the only managers in club history to win the award since its inception in 1983. 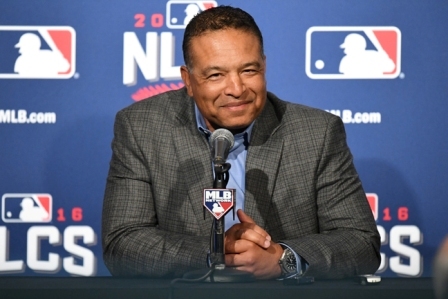 Roberts, the first African-American manager in franchise history, was also named as Sporting News’ manager of the year. The 44-year-old first-year manager took the Dodgers from a season-high 8.0-game divisional deficit in late June to a 91-71 record and a fourth consecutive National League West title, joining Tommy Lasorda (1977) as the only rookie managers ever to lead Los Angeles to a division championship. In the postseason, the Dodgers defeated the Washington Nationals, 3-2, in the Division Series, before falling to the Cubs in six games in the National League Championship Series. Roberts piloted the Dodgers through injury and adversity, using a franchise record-tying 55 players and 31 different pitchers, while the club placed 28 different players on the DL, the most for any team in the last 30 years. During the course of the regular season, Roberts made a Major League-record 606 pitching changes, navigating his bullpen to the second-lowest ERA in the Majors (3.35) and through 590.2 innings pitched, the most in the Majors this year and also the most in franchise history. Under Roberts’ leadership, Los Angeles led the National League with 46 comeback victories – second most in the Majors behind only the Rangers’ 49.